If you’re in need of refurbished or gently used cubicles for your Atlanta, Georgia, area business, turn to NorthPoint Office Furniture. We have an extensive inventory of gently used furniture, which allows us to provide our customers with good-looking yet affordable furniture options. 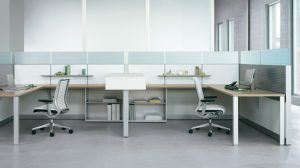 So whether your business is rapidly expanding and you need to get more workstations for your new employees or you’re looking to update the current furniture in your office space, our selection of used cubicles can be the perfect solution. At our showroom located just outside of Atlanta, a member of our friendly staff will help you find the furniture options that best fit your needs and your budget. When you come to us for refurbished cubicles, you’ll find that they are not only affordable, but they are a customizable as well. We are happy to provide you with samples of trim colors, work surfaces, and cubicle wall fabrics, all of which can be mixed and matched to design a cubicle station that looks and feels like new. In addition to our previously owned furniture, we also offer a selection of beautiful and functional laminate office furniture, for customers who prefer new office furniture with prices that are comparable to our used furniture selection. For more information on the refurbished and gently used cubicles we offer in the Atlanta, GA, area, contact NorthPoint Office Furniture today. We also offer a selection of used executive desks, chairs, filing cabinets, credenzas, conference room furniture, and any other furniture item you may need for your business.